UPDATED. Flash-based (s adbe) game site Kongregrate found itself excluded from the Android Market (s goog) today, but it’s still trying to figure out whether its exile is going to be permanent and if so, why it’s being singled out. The gaming site launched the Kongregate Arcade app earlier today, only to have it yanked after Google reportedly said that it violated the non-compete rules in the Android Market terms of service. 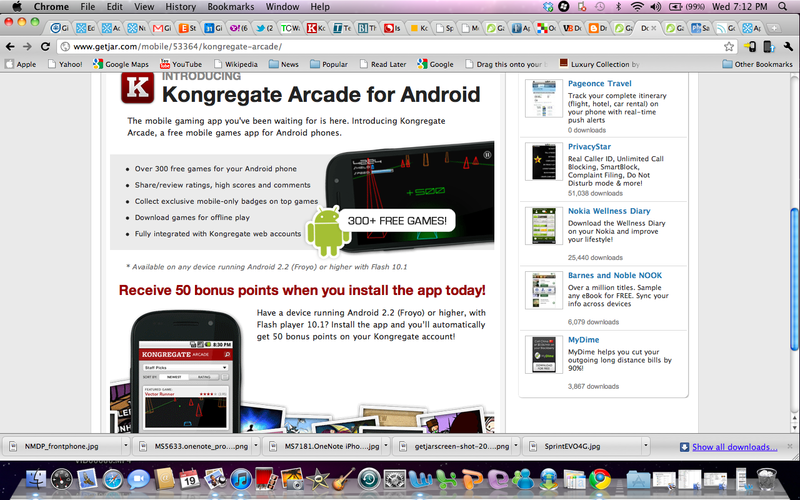 Essentially, Google seems to be suggesting that Kongregate Arcade is a competing app store. According to Jim Greer, the CEO of Kongregate — which was recently bought by GameStop (s gme) — the Arcade may look like an app store, but it’s actually a web browser that connects to the Kongregate site, Greer told VentureBeat. In this way, the app allows users access to hundreds of free games and allows them to cache those games for offline play. Greer told Joystiq that he was confused and shocked, and said the decision to call Kongregate Arcade an app store was a “pretty extreme stretch.” Greer said he previously showed the app to people at Google, who were enthusiastic about having it available in Android Market, though he said they weren’t involved in the decision. He’s holding out hope that Google erred in its exclusion of the app, saying it already allows some game emulators that include hundreds of games. I’ve reached out to Google for comment and hope to hear back soon. It’s possible that this could all be a misunderstanding — although VentureBeat seems to think that Google may be motivated by a desire to make room for its own gaming efforts. If this decision stands, it does strike a blow to Google’s arguments about how open Android is. That’s been a favorite talking point of Google executives in drawing a distinction between Android and iOS (s aapl). Apple has taken its lumps on numerous occasions for denying apps for a variety of reasons though it has made efforts to be more transparent lately. Denying Kongregate wouldn’t do any favors to Android’s reputation as a weak gaming platform compared to the iPhone. The platform is slowly getting bigger titles like Angry Birds, but it’s still not a priority for game developers. And while technically the app store competition argument may apply to Kongregate, it raises the question about what Google will do with other apps like Kindle that offer similar services. Kongregate is still being promoted through GameStop and being sold through GetJar, which is able to sell games direct to Android users. That is still a nice distinction for Android, which allows third-party app stores to sell apps. But until the Kongregate app rejection is sorted out or the rejection proves to be a mistake, it leaves a lot of questions about the role Google is taking in Android Market. UPDATE: Google responded with a statement standing by its decision to pull the Kongragate Arcade app. “Applications in violation of our policies are removed from Android Market,” Google said. The reasoning comes down to the fact that the Kongregate app, while it acts much like a browser, has the ability to cache games for offline play. That elevates it into a competing software distribution platform offering outside content, something the Android Market terms of service prohibits. It’s likely that a simpler app that listed Kongregate games and launched a traditional browser could get approved. Or if the games were submitted as individual apps, they would also fly. It seems a distinction is being made here between digital content like books or music and mobile apps, which is why Kindle and other services don’t appear to be in danger of being pulled. @Undertoad: I disagree. Google’s decision to deny the Kongragate app is purely driven by money. If you spend three hours playing Kongragate games each day, that is time you aren’t spending playing paid games from the Google app store. Y’know, this story should not be as big as it is, except that it shows the true kink in Google armor: as a company, it thinks like a developer. It applies developer logic to everything, and “regular” people don’t think like that. Never mind that it’s just a technicality. Never mind that it diminishes the app store, the Android experience, and communicates to the world that Android is not open. Never mind that you can get Kongregate apps with two additional steps (open browser, go to Kongregate). Never mind that Flash is a huge differentiator for Android. No, we’ve found this little technicality, and because we’re ultra-logical developers, and a contradiction cannot exist in a working system, we will reject the app. I’m a huge Google/open platform fan, but its big-picture weaknesses are annoying. Here I sit, my Verizon contract ran out yesterday, and I play 3 hours of Kongregate games per week on the desktop. I realize I can’t even play them on the iPhone, but does that matter? Devs will come up with new games. The contract is two years long and that’s a lot of time to dedicate to a platform. What do? Will Kongregate be offered in Amazon’s Appstore?